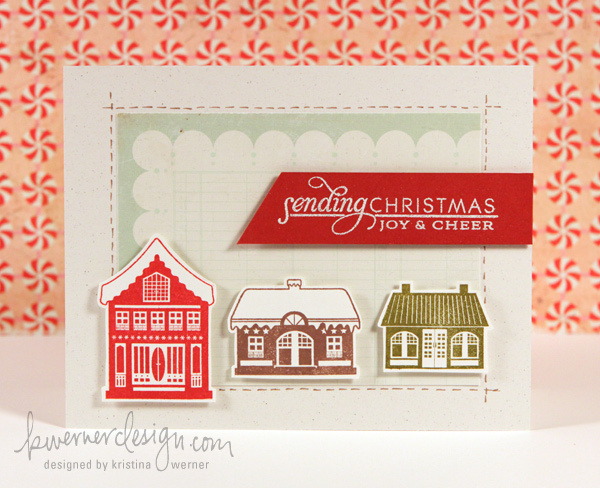 Last month, Kristina Werner put together her 25 videos for Holiday Card Series 2011 My goal was to play along and make a version of every card she did and I surprised myself by actually doing all of them! So, for the next 25 days I will be sharing them with you. I will always post a link and picture of the original card from Kristina, so you can visit her page and watch the video. I didn't always have the exact supplies she did, which worked out ok because I wasn't trying to copy the cards. I wanted to show that CASEing a card doesn't mean just copying it. Kristina's card for day 1 was super cute and simple. I didn't have any Christmas house stamps, so I decided to use three little Snowman instead. These are from Our Craft Lounge "Tweet Winter Wishes." I used Copic Markers to color and shade the edges of each snowmen and I also used some white sparkly fluff on each one as well. The pattern paper is from American Crafts "Merry Mint" collection which I had from last year and unfortunately, I don't think is available this year. and the sentiment is from Martha Stewart Crafts. Thanks for looking! I'll see you tomorrow! Great fun card love the snowmen thanks for joining in with PanPastel Uk this week. Wow, this is A M A Z I N G. What a beautiful card...love it! Thanks for joining us at Kaboodle Doodles’ Baby It's Cold Outside Challenge! Oh my word - your card is SO cute! Thanks for taking the challenge at Kaboodle Doodles! Wonderful job "casing" and I love the snowmen! Thanks for joining us this week at Kaboodle Doodle. That's truly awesome. 25 cards. Go you!! Thanks for joining us at IDIC. Very cute! I love snowmen! Thanks for joining us this week at Lollipop Crafts!